I really like this description and infographic. I’ll add this to my short list of links from Flip the Fleet that I regularly post to potential Leaf purchasers on social media. When I bought mine I had a large number of quick charges showing on the leaf soy app. I started cycling the battery slow charging only and over the next few months my battery SOH increased from 91 to 95 at the peak. I assumed this was changing the style of charge and with moving in to the summer months. 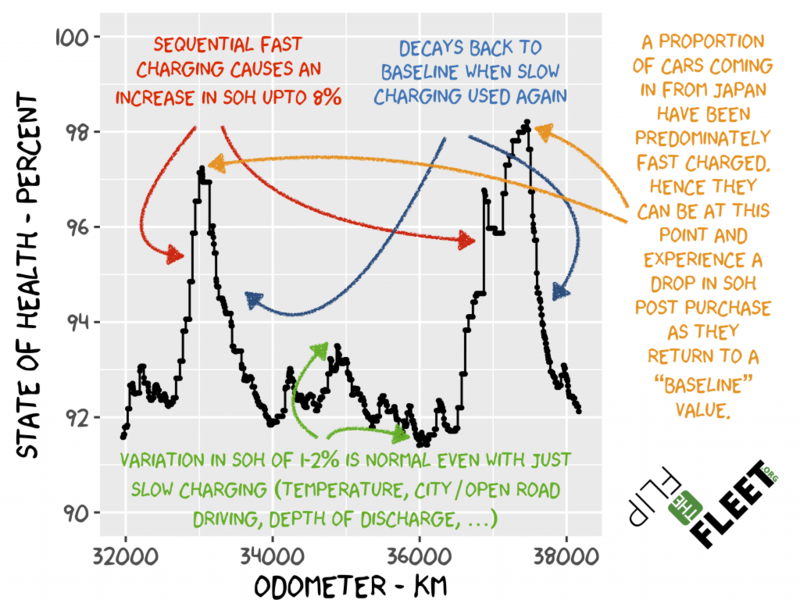 Yes, you can also see an increase in SoH post purchase if (1) the car was previously used in a cold area and now used in a warmer environment, (2) the previous estimate of SoH was low and fuller cycling of the battery lets the car see that it actually has more capacity. To show a higher SOH% and therefore a higher asking price – what would be the best way to ensure that? Good question! Sadly, we aren’t aware of a means of doing this check at present.